NOTE: It appears the worms are now in different places for different users. If you notice your worm in a different place than those shown below, feel free to send in a ticket with the new location (or a screenshot, if possible). A new 'quest' is now available within Moltara ; collecting worms! Unfortunately, it is a bit more tedious than it sounds. Continue reading on for a complete guide to this quest. 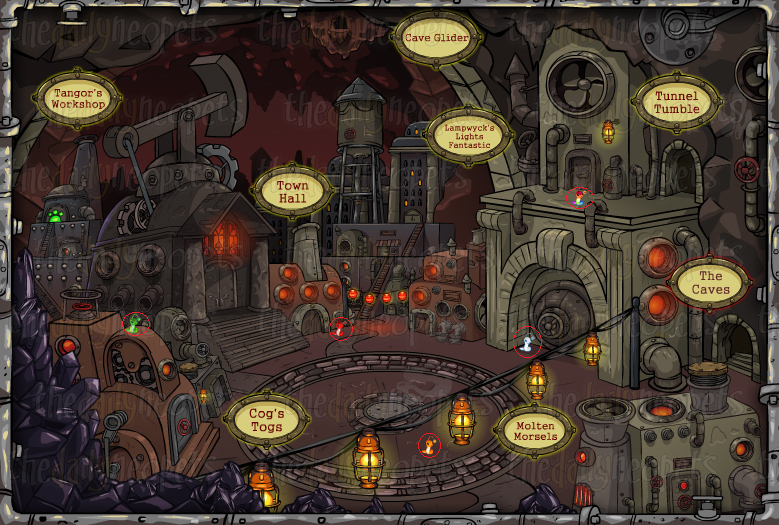 The first step of this quest is to enter Lampwyck's Lights Fantastic . A "random" event should occur instantaneously when the page is first visited. If not, refresh the page until it appears. The shopkeeper should place an Empty Lantern in the inventory, which will be used to collect the worms scattered about Moltara. 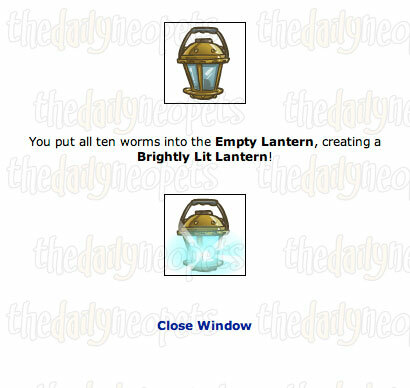 There is a total of ten worms, each of a different color, that need to be collected in order to fully fill the lantern. These worms are found all throughout Moltara, meaning that they are located in both Moltara City and the Moltara Caves . Five worms are in Moltara City while the other five are in the Moltara Caves. After capturing a worm, you have to refresh the map to spot another worm. It may take multiple refreshes before a worm turns up. The worm placement used to be the same for every user. Below are the original worm placements. Near the right side of the Town Hall. Right of the bridge leading to The Gilded Page. On top of the Cog's Togs shop. Near the steps of The Petpetorium. Lower-left area near Lampwyck's Lights Fantastic, in front of the vault. In front of the Magma Pool. In the cobblestone circle in the middle of the city towards the bottom right. Outside the very left cave behind the Magma Pool. Outside the Moltara Caves entrance. Outside the cave below The Arcanium. It seems that the worms now appear in different places for different people. Your worms will always appear in the same position, but these positions may not be exactly the same as someone else's. If you are unable to find all the worms, and one or two of them just haven't showed up for you for a day, you can always restart the worm quest. This is easily done by discarding your empty Lantern and your worms. You can just go back to Lampwyck's to get another lamp. After successfully capturing all ten of the worms, proceed to the inventory for the next step of this quest. Click on the item Empty Lantern and allow the pop-up to appear. From the drop-down list, select "Fill it with worms" and press the 'Submit' button. 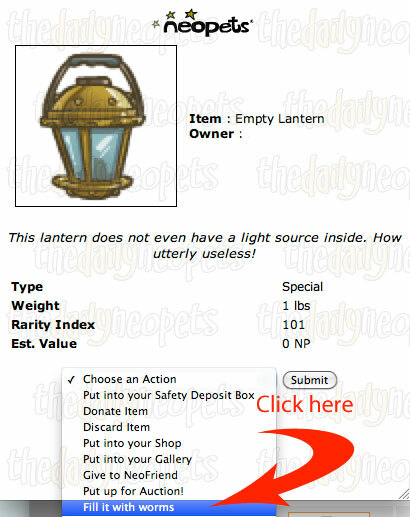 As a result of the worms being put inside the lantern, there should now be a Brightly Lit Lantern inside the inventory. The next task is to head to the Dark Cave , which is located to the right of the very back end of the Moltara Caves. With a now lit lantern, the cave should be bright enough to see in. 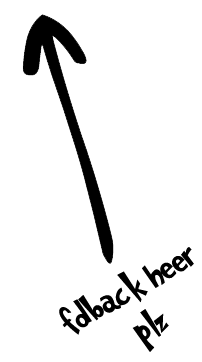 There are two options to choose from in order to proceed further into the cave; left or right. Before clicking anywhere, write down the first four words written underneath the picture. The starting sentence can help you to unfold the path you need to follow. Please refer to the table below for a list of all possible sentences and path combinations. Special thanks to nyllyn2 who gave us the authorisation to reprint her data . 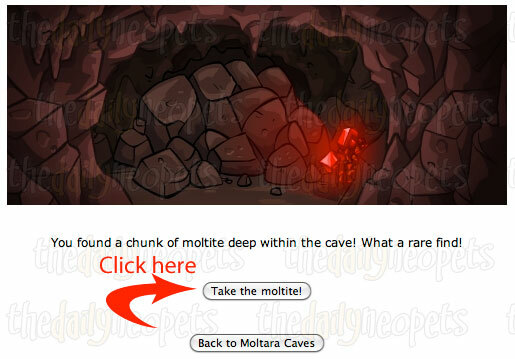 When the Red Moltite is found, click "Take the moltite!" so it appears within the inventory. Red Moltite is a material that can be used for combination with other items at Tangor's Workshop . 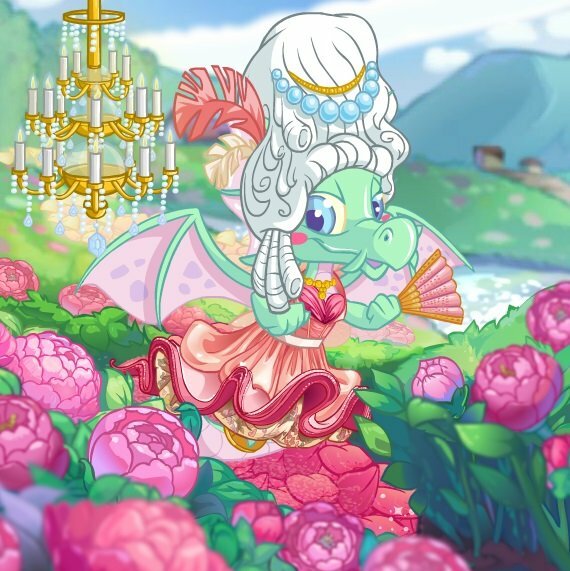 After retrieving the Red Moltite, return to Lampwyck's Lights Fantastic for a prize to those who completed the quest for their first time. The Buzz should take away the Brightly Lit Lantern and now replace it with a Friendly Glowing Lantern, which is wearable! 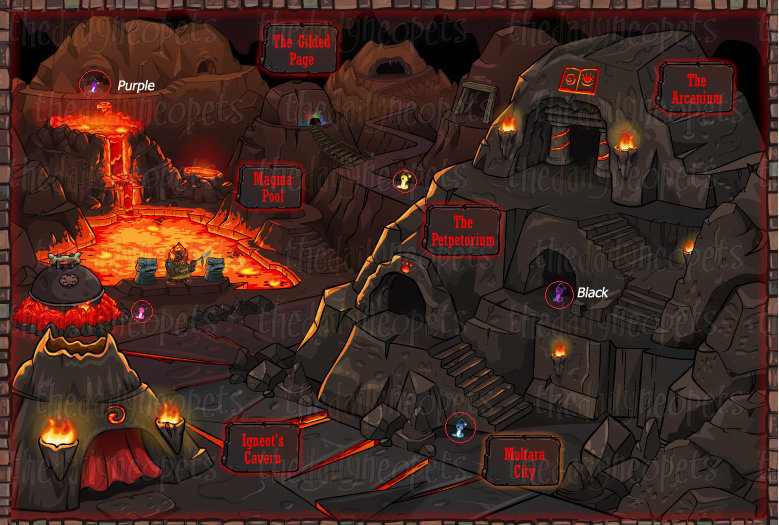 This quest is able to be completed once per day, awarding players with a Red Moltite each time. Other than the wearable lantern, the real purpose of this quest is to obtain Red Moltite. Those who are not interested in combining materials over at Tangor's Workshop may find it beneficial to only complete the quest once.